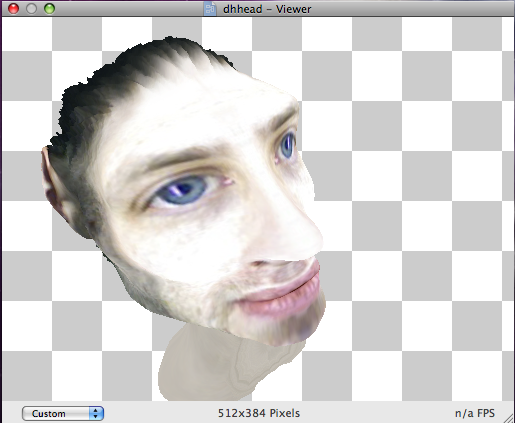 so well this funny to me cause its my head or a picture of me i wrapped around a sphere then made into audio reactive mesh blends as an experiment in realtime 3d deformations. i know the models are large there are 4 of them i haven't yet converted them to fbx, and they are really large i sub divided them twice. so that is the level of detail that eventually will be rendered but agreeably to large to wrap just a pic texture around. eventually it will be a talking head but i wanted to play in qc a bit with some audio so this is the test render. so i still have to sculpt out the finished head i am hoping to be able to blend 10 shapes but am having a lowered frame rate with 4 at the moment but i think that is because obj is sluggish. does anyone else think this a funny visualizer. Re: funny reactive k3d blend shapes. I think it would be even sweeter if you could also rotate the head alone. Converted the .obj to .fbx in Autodesk SDK and the speed up is noticeable to say the least at start up. about one third the time the .obj take. The .obj have more than 65536 triangles or 65536 points, which is an indication of maybe too much complexity - less is more in Quartz Composer, [in fact a lot of my time is spent getting the compositions to just slow down a little :-)], but give QC too much and it will slow its responsiveness and loading, rendering and manipulation of graphic objects, go up to 3d and the consequent processing cost increases almost exponentially. Whatever, its an amusing proof of concept. Re: funny reactive k3d blend shapes. displacement mapping ???? yeah i know i went with over kill on this, im just not sure how to do displacement maps and what not in qc to keep the models lower count. here is a pic of why they are so large this is a more polished version with hair etc.. that well i combed in mud box. what is the auto-desk sdk ??? is that just there fbx code or is it a program. i would like some universal converting program mainly to get into collada format without having to make plugins or find them for maya. i can get things to fbx no problem. your right i need to convert these the compile time takes for every but once its loaded it runs just at bad frame-rate where i like the slower one im going to convert these models fbx and see the performance. i shouldn't really call them models cause its really i sphere i deformed, the picture is what makes it look like a head. 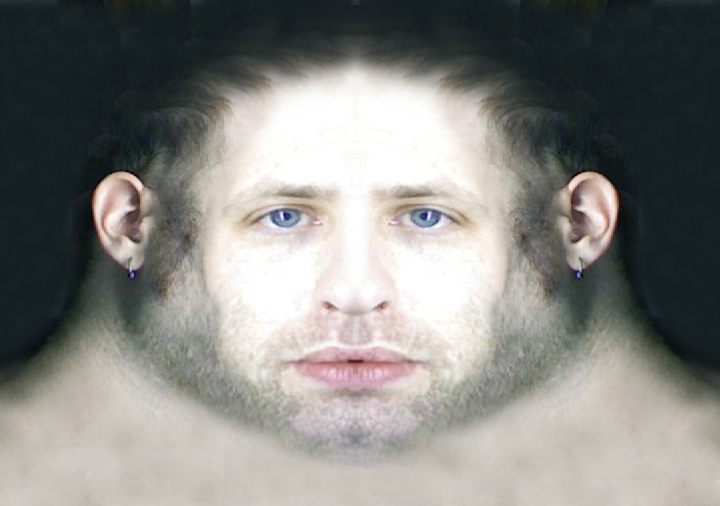 here is a uv map of my head i made in photoshop as well that you can use as a template for your own head you just need a photo from the front and back. +autodesk sdk - contains code and a valuable free convertor program with which a range of different 3d formats can be normalized to fbx format, helps for bringing stuff into other autodesk programs. the autodesk convertor does take in collada items. the resulting fbx files are often, though not always smaller in file size, even [sometimes] if embedding media. the 3ds file format only goes up to 65536 triangles or 65536 points, interestingly, the same number of points that are given as spline subdivisions in GL Spline . in regards of the less is more , consider that a very simple 3d object can be 'treated' , modified by various Kineme and Apple patches. of course, if you are looking for a total effect, more of an installation, then the only barrier is what level of rendering fidelity the hardware and software will support. if you are looking to run on the desktop, then IMHO, the item does need to be pretty nippy performance wise. i've recently been looking at the new nVidia CL CUDA toolkit / driver stuff and it is looking extremely good in deed for how fluidly it will be possible , if we 'stagger' or condition our output to meet the available GPU and GPU video memory, so this sort of performance issue that is evidenced here is likely to diminish. beware , I say thrice, beware the mopping up of extra CPU and GPU cycles with very GPU intensive models or media. well i brought the models into maya and they where huge and well exported them as fbx and didn't get any better results actually the models grew in size by 4mb i think i will give the sdk a try maybe size them down etc.